LIBERTY is an attractive and powerful gaining son of MAC F1 UPBEAT who combines a rare degree of eye appeal with a growth curve that has been rapidly accelerating since weaning. He is clean-made, strong topped and square hipped with easy-moving structure. His mother is a high-capacity and feminine daughter of MYTTY IN FOCUS. 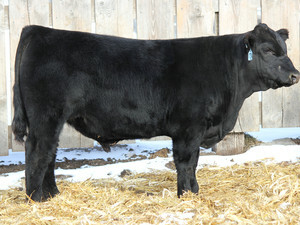 LIBERTY is a bull to add pounds to a calf crop while injecting an extra measure of structure and eye appeal.